Designer Michelle Rohrer-Lauer overcame a challenging footprint to perform a full renovation of this interior room and make it figuratively and physically the home’s central focus. Wadsworth, IL — Encountering challenges is par for the course for many renovation projects. But Michelle Rohrer-Lauer, Allied ASID/IIDA, was especially tested with this circa 1980s kitchen, which presented several unique obstacles. For one, the kitchen is an interior room, further complicated with four openings…one each to the living room, dining room, family room and guest room, which will ultimately become a four-seasons sunroom during a future renovation. The designer’s clients wanted to keep the original floor tile, but there weren’t enough spare tiles to fill in all of the voids created after removing the original island. As a solution, she created a frame for the new island with mosaic porcelain tile in a colorway that complements the original tile. 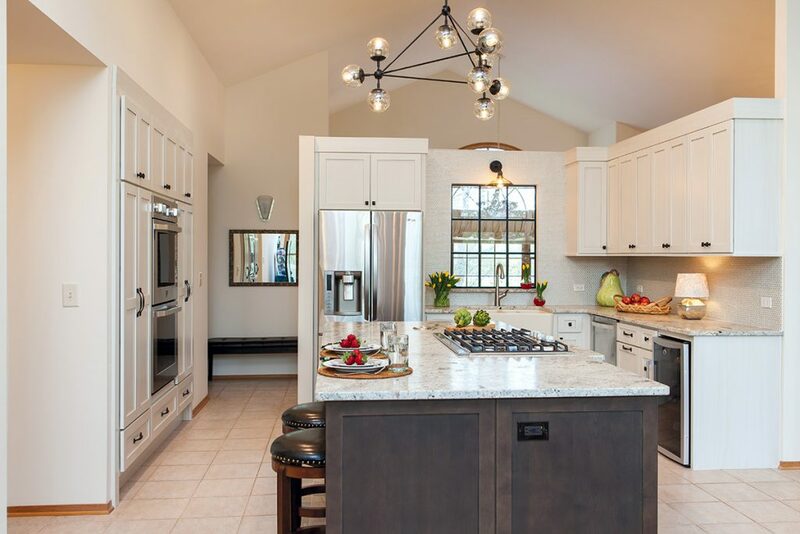 “The kitchen floats in the center of the house, so there are no windows to the outdoors,” says the designer, of Michelle’s Interiors Limited in Wadsworth, IL. Another challenge emerged when the homeowners wanted to keep the existing ceramic floor, which wasn’t necessarily a problem in and of itself, but the original three-sided island was going to be replaced with a new rectangular version. “That meant its footprint would change,” she says, noting she had limited availability of spare tiles to work with for patching. Additionally, the height and depth of the original cabinets, countertops and walls didn’t line up, thereby lowering the sight lines and creating an overall choppy appearance and a lot of wasted space. 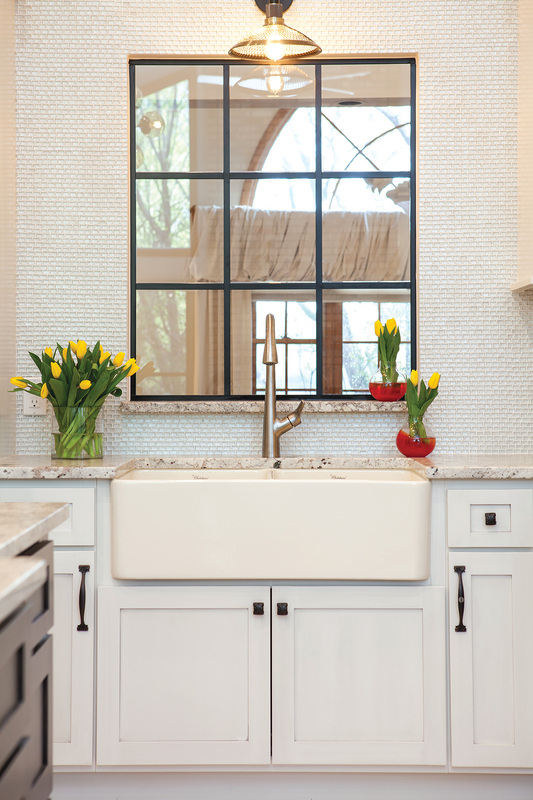 To address the first challenge, Rohrer-Lauer brought more natural light into the space by replacing the original narrow glass block window above the sink with a much larger, more on-trend, metal-framed clear window. She accented the new fireclay farm sink with an American Standard pull-down faucet with an extra-long hose and pause button so her client can fill large pots on the counter. 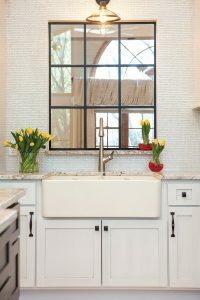 Michelle Rohrer-Lauer brought more natural light into the kitchen by replacing the original narrow glass block window above the sink with a larger, more on-trend, metal-framed clear window. It makes the kitchen brighter and improves sight lines by providing a view through the living room windows to the yard. Solving the challenges of the island and its new footprint was a bit more involved, given that there weren’t enough spare tiles to fill in all of the voids created after removing the original island. As a resolution, Rohrer-Lauer created a frame for the new island with 3″x3″ Daltile Ayers Rock porcelain tile in a colorway that complements the original tile. “It looks like it was always meant to be,” she says. 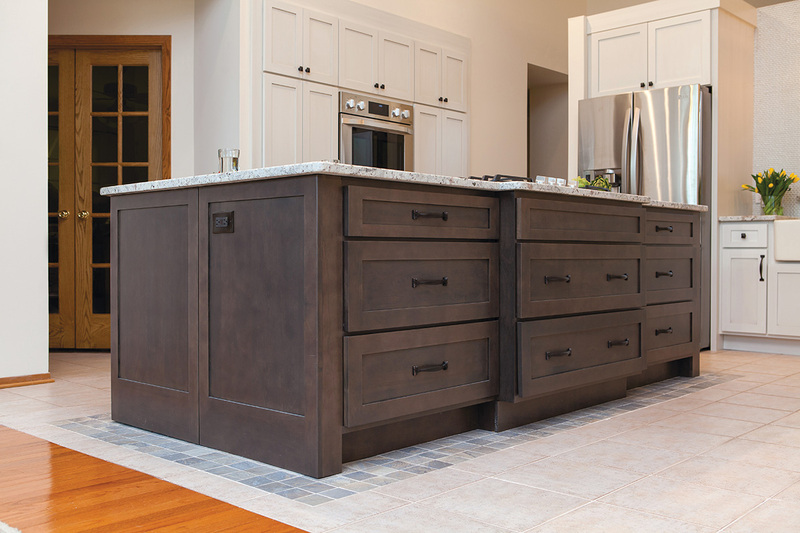 The new island also improved traffic flow through the kitchen while providing more work and serving space. Plus, its new shape and orientation gave the homeowners a more attractive view when they are working at the island. “Previously, the island faced a hallway…not an exciting view,” she points out, noting that its new vantage point offers a view through new French doors that will showcase the outside when the guest-bedroom-turned-sunroom is completed. Rohrer-Lauer located the GE gas cooktop and Whirlpool downdraft in the island, along with a Sharp microwave drawer and plenty of storage, including some open shelves for her client’s beloved cookbooks and several deep drawers for pots and pans. 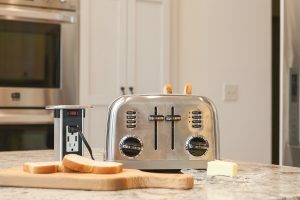 She added a pop-up electrical outlet within the island’s Serenity granite top to control cord chaos when using small appliances, and she sheathed the Crestwood base cabinets in a Basalt finish, which helps tie the otherwise all-white kitchen to the rest of the home. To create a more cohesive look, Rohrer-Lauer removed a desk and created a focal-point wall that includes a double oven flanked on each side by pantries and drawers. Renovating the kitchen’s perimeter solves challenges associated with the previous floorplan’s inefficient use of space as well as the ‘choppy’ appearance created with cabinets of different heights and depths. There was also a seldom-used desk that had become a ‘catchall’ for clutter. “Nothing flowed well or related to each other,” she explains. To create a more cohesive look, Rohrer-Lauer started by removing the desk and creating a focal-point wall that includes an LG convection double oven flanked on each side by pantries and drawers that her client uses for storing dry goods and larger cooking appliances. Creating more storage was an important consideration for the new space, so the designer incorporated more drawers that are full extension and soft close rather than having doors. She also deepened the upper cabinets to 13″ to better accommodate plates and added a built-in trash bin and recycling center, additional ‘must-haves.’ In the end, she created 36 square feet of additional storage within the kitchen’s original footprint. 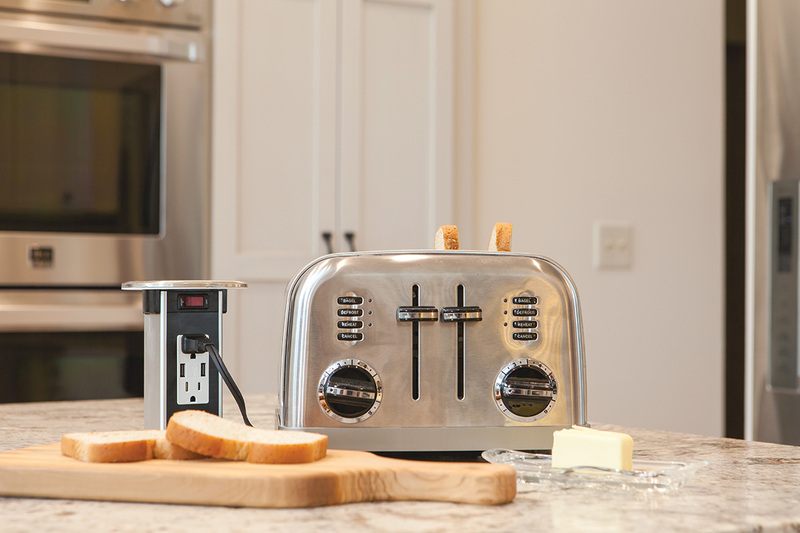 A pop-up electrical outlet within the island’s granite top controls cord chaos when using small appliances. Rohrer-Lauer also reconfigured a portion of the ‘floating wall’ when she relocated the oven and replaced it with countertop space and an undercounter GE beverage/wine refrigerator. 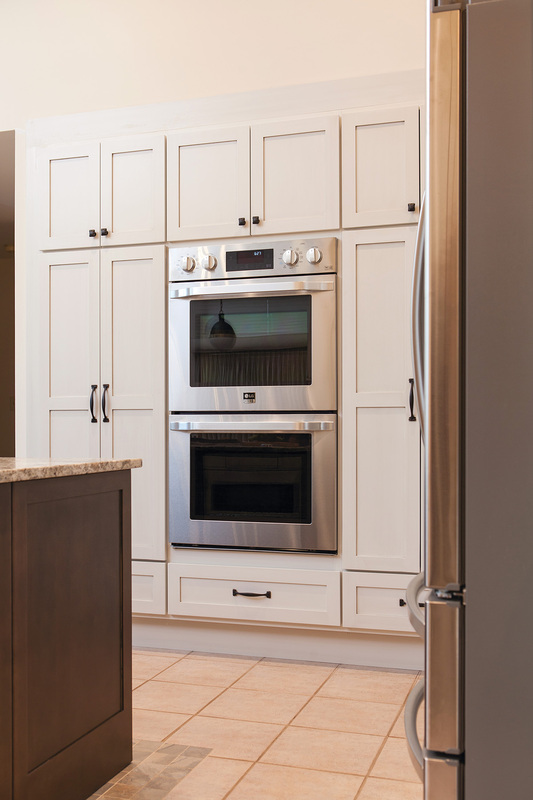 “She now has a lot larger task area and, by moving the wall oven, that area is more open and inviting,” she notes, adding that it also gives guests a convenient place to set their dishes as they enter from the dining room. Rohrer-Lauer completed the space by designing a backsplash crafted from Chapter 1: Suite Glass Varadero Belle Mare mosaic tile. She also improved lighting by adding more recessed cans in the ceiling and including decorative and task lighting over the island and sink, all of which are switched independently with dimmers.